These two Quintets for Piano and Winds are the most famous in the world of art music for the grouping of piano, oboe, clarinet, horn and bassoon. Beethoven used Mozart's Quintet as his role-model; therefore, it is not surprising that both works are in the key of E flat major, have three movements and are quite similar as to form. Other strong similarities are that both works have great elegance and stature and are guaranteed to lift listeners' dispositions. Of course, Beethoven's Quintet is not a clone of the Mozart Quintet, and the piano parts constitute the primary distinction between them. In Mozart's Quintet, the balance between piano and winds is of the utmost importance; Mozart considered this balance so perfect that he wrote to his father that it was "the best work I have ever composed". In contrast, Beethoven gives the piano a leading role that even includes cadenzas. Excellent performances of these two works convey the full measure of their optimism, architectural balance, and stately demeanour. However, most important is to detail the deliciously pristine dialogue among the instruments. Both works possess a tremendous capacity to offer some of the finest and most natural conversations found in the entire classical repertoire. Only masterful composers are capable of providing transcendent levels of dialogue, and both Mozart and Beethoven are at the top of the mountain. The Mozart and Beethoven Quintets are commonly paired on disc, and the Sony recording from Murray Perahia and members of the English Chamber Orchestra is generally considered the most rewarding of the modern era. I am happy to report that the Danish group holds up very well in this company and even trumps the ECO in a few areas. Gothoni and company are quicker in all the outer movements, imparting greater excitement, drive and youthful exuberance than Perahia's group. Another advantage concerns the fact that Beethoven's music has a gruff quality not found in Mozart's works. The Danish group plays up this distinction very well, giving Beethoven's Quintet a compelling angularity. Essentially, Perahia and the ECO members play Beethoven in the same suave manner as Mozart, although they certainly recognize that the piano takes the lead in the Beethoven. Finally, the CLASSICO sound is more immediate, crisp, and detailed than the Sony. I do have two reservations about the disc for review. One is that Gothoni's projection is sometimes too demure, while Perahia's is nearly perfect. Also, Gothoni doesn't give Beethoven's 2nd Movement the loving treatment afforded by Perahia. 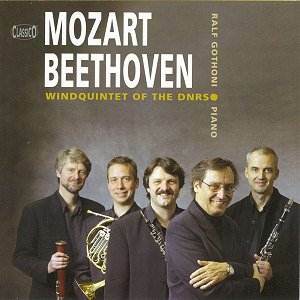 On balance, the recording from Rolf Gothoni and the Wind Quintet of the Danish National Radio Symphony Orchestra offers exceptional interpretations of the Mozart and Beethoven Quintets that stand tall next to the Sony recording of the works. I love their youthful exuberance and the gruff demeanour they impart to the Beethoven Quintet. This is one of the best recordings I have heard from CLASSICO, and it will be in the running for one of my MusicWeb Discs of the Year 2004.